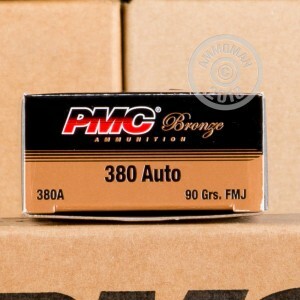 This economical 1,000 round case of PMC ammo in .380 ACP will help you get the trigger time you need to defend yourself should the need ever arise. It's the perfect practice load for popular .380 Auto pistols such as the Ruger LCP, Colt Mustang, and Smith & Wesson Bodyguard. Each case holds 20 boxes with 50 rounds apiece. This ammo uses a 90 grain full metal jacket bullet as well as non-corrosive Boxer-primed brass cases. It is made in Korea by Poongsan, a top supplier for the South Korean military, and undergoes rigorous quality control processes to ensure that you get what you pay for. Poongsan's large production capacity helps keep costs down and has made PMC brand ammo extremely popular among budget conscious shooters who don't like compromising on reliability or quality. 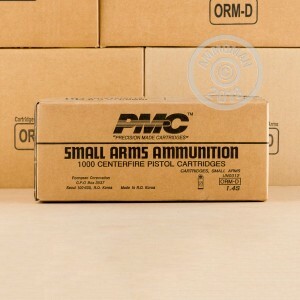 To help you stay on the range without breaking the bank, AmmoMan.com ships all orders such as this 1,000-round case (and all orders over $99) free of charge. The PMC ammo is great, no problems at all. I'll be back. Excellent all around range ammo! I'm working on my second case of 1,000 rounds using my 1972 Walther PP. Obviously I was pleased with the first 1,000. I have found PMC ammo to be very reliable. I have no feeding issues with either my factory or Mecgar mags, nor have I had any issues with the reliability of the ammunition. All in all, it's great stuff. Reloadable brass (which I save in the hope of getting a reloader some day), cleans up easily, goes bang every time. What more could you want? Ammoman is great as well. I've been using them for years. They have excellent prices (don't be fooled by a lower price that doesn't include shipping! ), and they ship ultra fast and free for most bulk buyers. Great product, great price and quick shipping and delivery. Very happy with Ammoman and their products and shipping. First time with this caliber and so far so good. First time buyer. Will definitely be a returning customer!!!!!!!! The experience was great as a first time buyer! Used ammo immediately. Great! First time I've u this ammo on my Sig .380. It's great. Good price and quick shipping. Ordering more now. 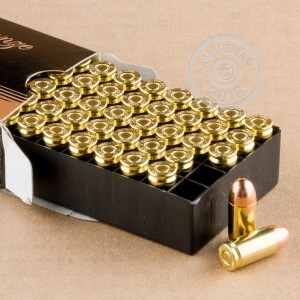 Ammo shoots well and give you a good idea of they weight you want your round to be in JHP. As Always shipped fast and arrived just as quickly as always! Thanks Ammoman!